Great review as always, @Aditya sir! Gets a well-deserved 5-stars from me! The XUV300 is surprisngly a Mahindra for me. They're on a roll ever since the Marazzo has come in. The quality has gone up since the XUV500 days and this is a good thing. We surely didn't expect such competent products from our homegrown manufactures 10-years ago. Its indeed a proud moment for us Indians to see products which are now more-or-less ready to take on the global markets. The XUV300 is an interesting package loaded with tech. My dad, a noob when it comes to tech was actually surprised with the XUV300 when his colleague got one in the fully-loaded trim. He was impressed with the overall kit on offer. In comparision, our 2-year old Hexa felt barebones The only thing which didn't impress him are the highway manners. Otherwise, its a well-rounded package and there's hardly anything to fault with the car. Only if M&M could've given us a well-specced mid trim for the budget minded folks. The W8(0) is glaringly expensive. It has the equipment to back its price but it ain't a Hyundai when brand image is concerned. The XUV300 W8(0) costs roughly the same as the XUV500 W8 did in 2012! Mahindra could've gone a bit more agressive with the pricing. Overall, the XUV300 has opened up a whole new level of expectations from Mahindra. Great review! So it is a very good car. I personally am saddened by the high costs of cars these days. The weight of prior knowledge is surely to blame; there was a time (around 2008 roughly) when Rs.10 lacs would get you a Scorpio. I know that and these facts as well - there's a 4-6% YoY price increase announced by OEMs, there have been a lot of features added to cars viz. safety, comfort etc. Inflation being what it is, prices overall have gone up. The power of compounding does astound me. And someone like Jeremy Clarkson might even condescendingly tell me that it is my problem if I won't/can't pay for this exceedingly good car. I don't know why exactly I feel this way - but I feel that Mahindra are banking entirely on the customer's willingness to pay here, as it is with iPhones. It can't be all due to inflation and high input costs in the XUV 300's case. The gap between the cost to build such products and their MRP is a huge, yawning chasm. Nothing but the customer's willingness to fill that chasm can justify such prices, or at least that's what I feel. Now, if only the early movers who buy newer cars every year (I'm looking at the kind who live in richy-rich Coimbatore) keep disposing of their cars quickly, us conservative folks can enjoy these vehicles in a pre-owned state at sane costs. Note: I'm not penny-pinching here. It just doesn't appeal to me to put in so much money on this kind of a car. It's not for me. Sorry. First of all, Aditya, I blame you for diverting me from a hectic Monday schedule. Couldn't help but read this excellent review in one go. Coming to the beast itself, the XUV300 is an excellent package that surely ups the expectations from this segment hereon. Although some things like the cooled glovebox can given a blind-eye, the biggest grouch in here would be the missing rear air-con vents. Hope to see Mahindra add that to the otherwise well-loaded and well-equipped package. Will be interesting to see how the competition responds to this fierce competition from M&M. For me this review is a gift for my 4th wedding anniversary (1st one as a bhpian). Even though I am not interested in buying this car, an official review from team-bhp is so satisfying for the heart. As always it is a five star review. It is like watching Dhoni finishing off a game in the last over. Excellent review Adithya, rated a full 5 stars! When I got to test drive the XUV300, it didn't feel like a Mahindra to me and now I can confirm my thoughts with the official Team-BHP review. Mahindra has got it almost right except for that small boot and higher pricing. The overall whole package also seems to be more functional than funky which is a good move IMO. It will surely be a good choice for small families who want a compact SUV with some kind of exclusivity. On a side note, the scenario of XUV300 in the market can be related to the movie 300 in which a small group of men hold their ground against a huge Persian army. We all know who the Persian army is in our context . So the question here is, can the XUV300 repeat history like the Spartans? I find the side profile quite disproportionate due to the chopped off rear (the Tivoli has such a balanced profile) making it too stubby. Add to it the loss of practicality wherein the XUV300 has only 60% of the boot space of the donor car, it is a disappointing reengineering exercise to bring it to within the 4m mandate. As usual a very neat review covering all the important aspects of the car. I wonder what is the breakup of these cars being sold. While the top-end has all the fancy features, It is priced at a premium and this i believe is a gamble by Mahindra to drive away Creta 1.4 sales. Korean connection seems evident too. the car is more like a Hyundai than the typical Mahindra cars. While some form of AT(mostly AMT) will follow soon, Boot space is another let down. Top end car can't even support any roof racks as it will render the sun-roof pretty much useless anyway. Thanks Aditya, excellent detailed review. Looks are personal but I feel XUV300 has got enough cues to appeal to masses. Albeit, I think, the lower variants are over priced especially when competition has good featured lower variants at more affordable prices than XUV300. Missing automatic is a let down, they are not gauging the pulse of people. If you take the competition, Brezza VDi AMT (8.7 L), Nexon Revotron XMA (7.8 L), Ecosport 1.5 AT Trendplus (9.8 L), we see they have lined up Automatic and that too at lower prices than manual variants of XUV300. M&M I guess should consider an Automatic variant perhaps before the festive season. Last edited by Thermodynamics : 15th April 2019 at 14:53. 2. White interiors (being a fan of black/dark shades, even beige/brown are hard to digest. But this takes it a few notches beyond practicality in India). At the far end of my budget, it's still Verna and Ecosport that have managed to be on the list for me. Now awaiting Venue launch, before I can make up my mind to finally commit and sign the dotted line. Thanks a ton for the review. Have been waiting for quite a while. 1. Boot space. One of the reasons to move out of my current car was this. Saw the photo provided in the link, the suitcases will be empty and will bend in a bit. If it is stuffed it will bulge and even lesser space will remain. Indians are not know to pack light. 2. Price, at 14-15L on road Bangalore it is good 3L more expensive than Nexon XZ+. The feature list really does not add up to 3L. Also if I am spending 15L why not spend another 1L and get the Creta SX variant. I am quite happy I went ahead with Nexon, I don't see I have missed much though the 7 airbags will be something always in my mind. We were considering to buy a sub-4m crossover for my mom, and although it's personal opinion, but all three of us disregarded the car in one look at the interiors and boot space after the showroom visit. The mix and match of beige, silver, piano-black, chrome and black gives the dash a rather too loud appeal when you see it in person. The HVAC control unit also looks like something from a decade ago! No doubt the car gives a Hyudai-like feeling when you feel the fit and finish at a standstill, but the moment one gets behind the wheel, the Mahindra traits become obvious. On the flip side, the news about Hyundai Venue started pouring in along with the DDCT bit, and the decision became obvious. Apart from that, as usual an amazing five star review! That's a very well compiled and a thorough review! - Irrespective of the steering modes, the steering is extremely light at its core. The different modes only add weight to the steering, nothing else. There is minimal feel and feedback and it does not even feel connected to the car. - The maintenance of the ivory seats is a horror story on its own. I found this to be true during my test drive as well. I thought it was a one-off thing, but it takes some effort to shut both the front doors, rear ones seemed fine though. 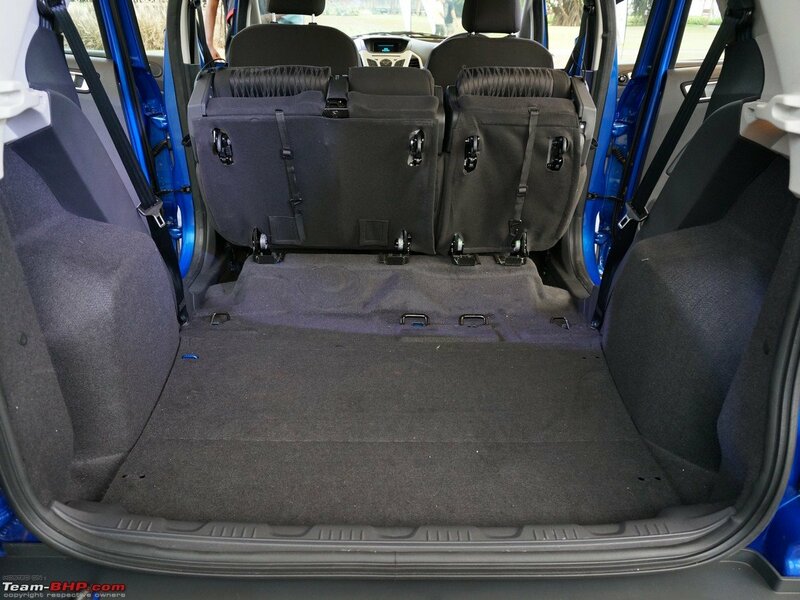 I checked with a Ford dealership last month and apparently the tumble seats have been removed from EcoSport now. Last edited by kubectl : 15th April 2019 at 19:26. Lack of AT and inadequate boot is the dealbreaker for me in case of the XUV 300. I find it hard for XUV 300 to establish itself against the upcoming Hyundai Venue, Brezza, Ecosport and Nexon. While I commend the overall package that the XUV300 is (pricing included), I'm kinda disappointed with the less than stellar engine performance. For a sub 4m car, 200 & 300 nm for petrol & diesel respectively is hot hatch territory (by Indian standards). However, the atleast as per the review, there's no "pedal-to-medal-grin-on-your-face" experience. Maybe my hopes were too high.